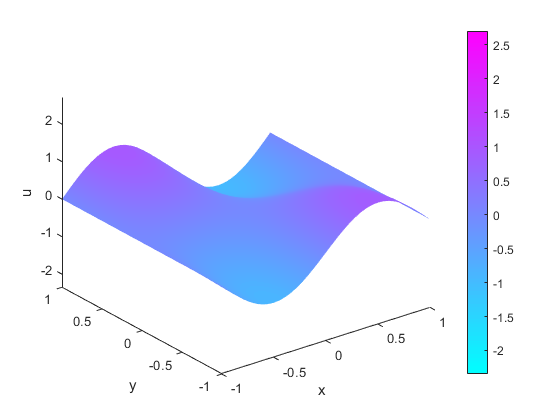 This example shows how to solve the wave equation using the solvepde function. So the standard wave equation has coefficients m=1, c=1, a=0, and f=0. Solve the problem on a square domain. 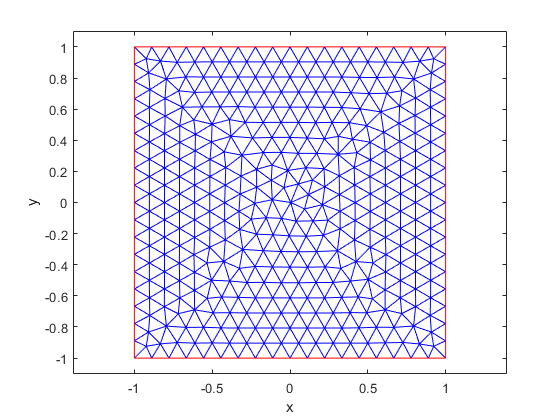 The squareg function describes this geometry. Create a model object and include the geometry. 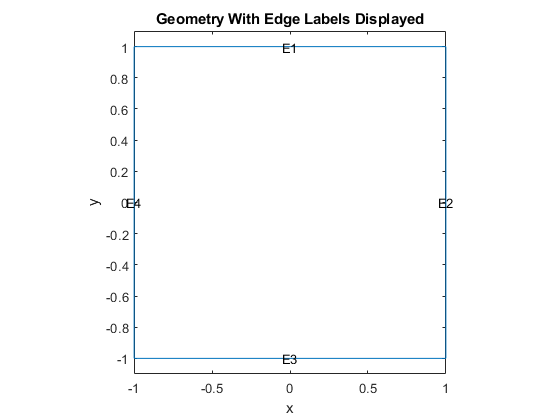 Plot the geometry and view the edge labels. Set zero Dirichlet boundary conditions on the left (edge 4) and right (edge 2) and zero Neumann boundary conditions on the top (edge 1) and bottom (edge 3). Create and view a finite element mesh for the problem. This choice avoids putting energy into the higher vibration modes and permits a reasonable time step size. Specify the solution times as 31 equally-spaced points in time from 0 to 5. Set the SolverOptions.ReportStatistics of model to 'on'. Create an animation to visualize the solution for all time steps. Keep a fixed vertical scale by first calculating the maximum and minimum values of u over all times, and scale all plots to use those z-axis limits. To play the animation, use the movie(M) command.